WINNIPEG, MB – Hard rock titans Disturbed have announced a 2016 date in Winnipeg in support of their most recent studio release, Immortalized, via Reprise Records. 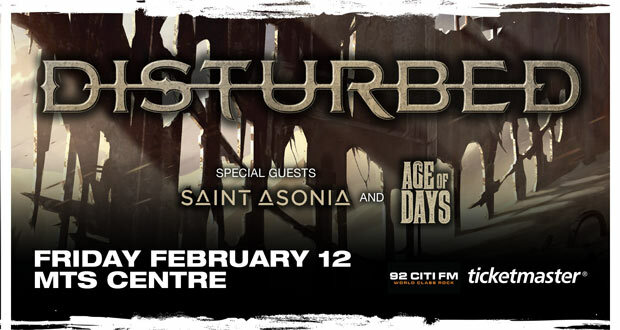 The tour, which visits MTS Centre on Friday February 12, 2016, also features special guests Saint Asonia and Age of Days. Tickets go on-sale to the general public on Friday, November 27, 2015 at 10:00am through Ticketmaster. Ticket prices start at $39.50 plus fees. Formed in Chicago in 1996, the multi-platinum Disturbed – David Draiman [vocals], Dan Donegan [guitar], Mike Wengren [drums], and John Moyer [bass] – have sold 12 million albums globally, scored nine No. 1 singles at Active Rock Radio, and had four consecutive albums debut at #1 on the Billboard Top 200, a feat shared only with Metallica and Dave Matthews Band. Their quadruple-platinum 2000 debut The Sickness formally announced their arrival as hard rock leaders, with that status solidified by their subsequent Grammy Award nomination as well as gold-, platinum- and double platinum-certified records. Saint Asonia featuring two of the biggest forces in rock radio over the past decade, Adam Gontier (formerly of Three Days Grace) and Mike Mushok (of Staind), along with band mates Corey Lowery (Stuck Mojo) and Rich Beddoe (Finger Eleven), released their self-titled debut album on July 31, 2015. Their single Better Place has already reached the Top 15 at Active Rock in the U.S. and Top 10 on Canadian Rock charts. Canadian guitar-rockers Age of Days are set to follow up their smash debut album, Hollywood Ending, with another killer rock album. Known for their powerful melodic vocals and heavy guitars, Age of Days returned to the studio in 2012 and recorded with Juno-award-winning writer/producer Brian Howes (Daughtry, Nickelback, Hinder, Rev Theory, Puddle of Mudd) in Los Angeles. The first single, Bombs Away, hit Canadian radio in September 2012 and remained on the rock charts for 27 weeks, reaching as high as #16. The second single, Broken, is a gritty, emotional rock tune that is sure to capture the hearts of the band’s existing fans, and win the hearts of millions of new fans across North America.